Waltz is a dance born in the suburbs of Vienna and in the alpine region of Austria . As early as the seventeenth century, waltzes were played in the ballrooms of the Hapsburg court. The weller, or turning dances, were danced by peasants in Austria and Bavaria even before that time. During the middle of the eighteenth century, the allemande form of the waltz was very popular in France . Originally danced as one of the figures in the contredanse, with arms intertwining at shoulder level, it soon became an independent dance and the close-hold was introduced. The waltz was criticized morally and as a threat to the dancing profession because it was easy to learn and utilized closer holds and rapid turns. However, the antagonism only served to increase the popularity of the waltz. Reportedly, the first time the waltz was danced in the United States was in Boston in 1834. 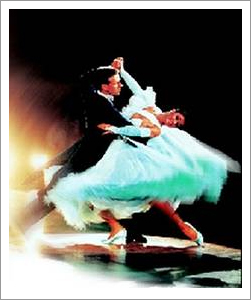 Around the close of the nineteenth century, two modifications of the waltz were developed. The first was the Boston , a slower waltz with long gliding steps. Although the Boston disappeared with the first world war, it did stimulate development of the English or International style which continues today. The second was the hesitation, which involves taking one step to three beats of the measure. Hesitation steps are still widely used in today's waltz. Originating in Spain or Morocco , the Tango was introduced to the New World by the Spanish settlers, eventually coming back to Spain with Black and Creole influences. In the early 19th Century, the Tango was a solo dance erformed by the woman. The Adualisian Tango was later done by one or two couples walking together using castanets. The dance was soon considered immoral with its flirting music! Ballroom Tango originated in the lower class of Buenos Aires , especially in the "Bario de las Ranas". Clothing was dictated by full skirts for the woman and gauchos with high boots and spurs for the man. man danced in a curving fashion because the floor was small with round tables, so he danced around and between them. Styles vary in Tango: Argentine, French, Gaucho and International. Still, Tango has become one of the American 'Standards' regardless of its origin. Phrasing is an important part of Tango. Most Tango music phrased to 16 or 32 beats of music. Tango music is like a story. It contains paragraphs (Major phrases); sentences (Minor phrases); and the period at the end of the sentence is the Tango close. The Slow-foxtrot came into being long before the Waltz. The dance has a lot of variations which later, adapted or not, were imported into the Waltz. This dance is one of the most natural dances from which the jury members can see whether a couple can dance or not. the movements are natural and faithful to the normal walk. It was introduced in Europe just before World War 1, from its origin the Foxtrot was a passionate dance with slow and quick movements, they say the name comes from a musical dancer Harry Fox. The European dance teachers were not enthusiastic about the "wild" character of the Foxtrot and started to polish it more. Between 1922 and 1929 Frank Ford, with whom Josephine Bradley used to give demonstrations, developed the basic movements of the Slow Foxtrot. With his interpretation he won the 1927 "Star Championships" with partner Molly Spain. Many of the figures they danced are still used by today's competitors. Strict tempo music was not yet invented in those days. The Foxtrot could be played at anything from 40 to 50 Bars/min, and it is easy to guess how styles had to be rapidly altered according to who was conducting the band! But once "Victor Silvestor's band began recording the problem was solved. In 1920 Miss Josephine Bradley danced withe Mr G.K. Anderson, a dancer with with many natural talents, to whom we owe many (slow-)foxtrot figures. In imitation of these wonderful dancers the feather-step and the change of direction were introduced, more or less by chance. It is impossible to imagine our present Slow-foxtrot without these two figures. The on-end dancing of steps dates from 1922. The making of "heelturns" was not known yet. It was Mr Frank Ford, winner of the "star-championships", to whom we owe most "new" figures which are still danced. The Quickstep is derived from the Foxtrot. During the twenties many bands played the Slow Foxtrot too fast, 50 Bars/min, the large open steps from the Foxtrot could not be danced on this speed. The English developed from the original Charleston a progressive dance without kicks and made a mixture with the above mentioned fast foxtrot the called this dance "the Quicktime Foxtrot and Charleston". The English couple Frank Ford and Molly Spain danced on the 'Star' Championships of 1927 a version of this Quicktime Foxtrot and Charleston without the characteristic Charleston knee actions and made it a dance for two instead of solo. The figures were Quarter Turns, Cross Chassées, Zig-zags, Cortes, Open Revers Turns, and Flat Charleston. In 1928/1929 the Quickstep was definitly born with the characteristic chassées steps.